You will either love me or hate me for this post. Regardless...I HAVE to share it before January officially comes to an end. for the Holiday Season + Beyond!! 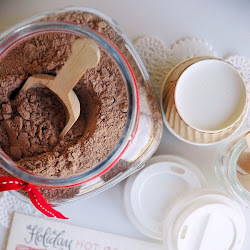 you will thank me later when the 2015 holiday season sneaks up later this year and you and I are already fully prepared for treating the people in our life with some of the best vanilla extract because we will have been aging it all year! I LOVE all things homemade and vanilla extract is no exception. It's sooooo easy to make and takes such little effort we should ALL be doing this on a regular basis. I LOVE making it for holiday gift giving. The problem is...I usually remember I need to start a batch WAY too late to actually have it ready in time to actually give as a gift. (it takes at least 6 weeks of aging to make it suitable for baking). Yes, there have been some holidays where I've realized, once again, my vanilla extract won't be ready on time and I thought about giving it anyway and adding a little note to the bottle saying..."will be ready for use by..." But that just really translates into: "Hey...I didn't plan ahead and although your gift isn't necessarily ready to give you...you are getting it anyway". So...when I found myself AGAIN this last holiday season unprepared for gifting delicious homemade vanilla...I vowed never to find myself in that situation again. I decided to start the process RIGHT AFTER the hustle and bustle of the holidays and be completely prepared for next year. Did you know the longer you let the vanilla cure/mature the more rich and beautiful and delicious the end flavor will be. In fact, letting the vanilla age for 6 months to a year (or two) will result in the best vanilla your heart (and baked goods) will ever experience. 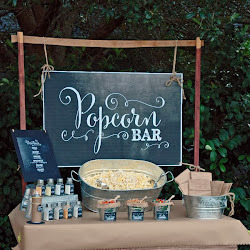 which means we will be ready for gift-giving when everyone else is scrambling for ideas. But let's back up for a minute. 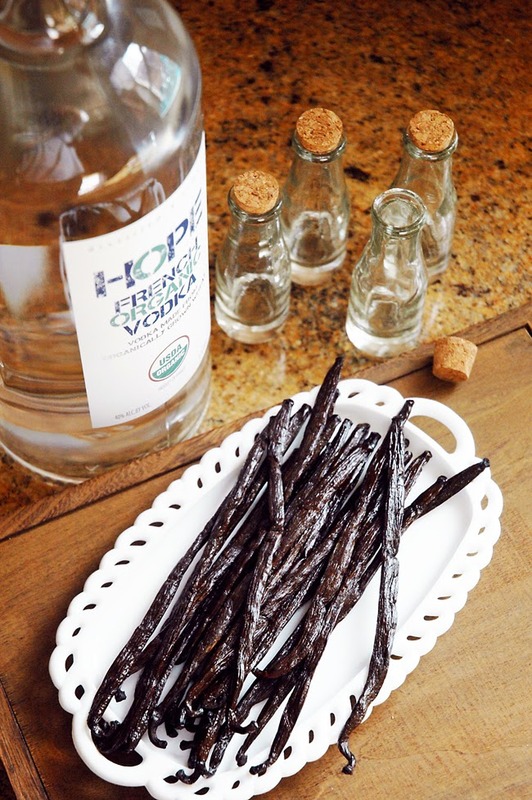 Homemade Vanilla Extract isn't just a gift for the holidays. Remember...6 weeks is all it REALLY takes for an acceptable curing time...anything longer just makes it all the better. And I'm all about better so I'm shooting for the full year. 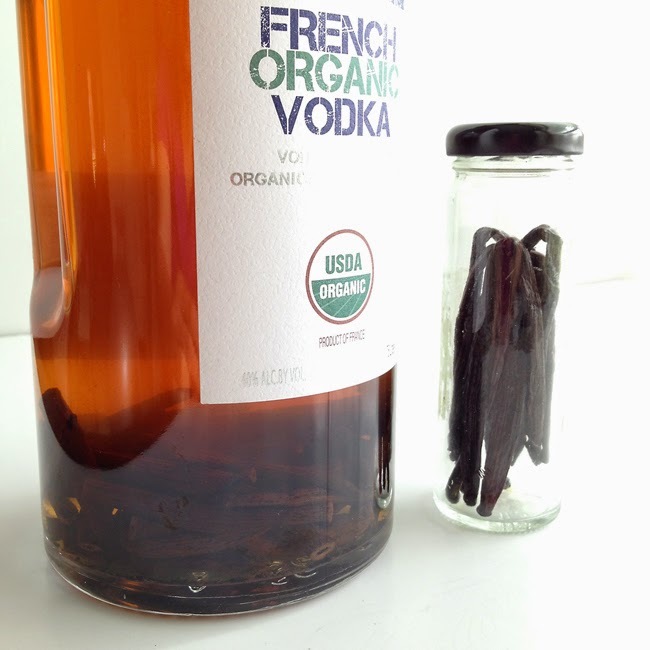 All you need in Vodka, vanilla beans and patience. 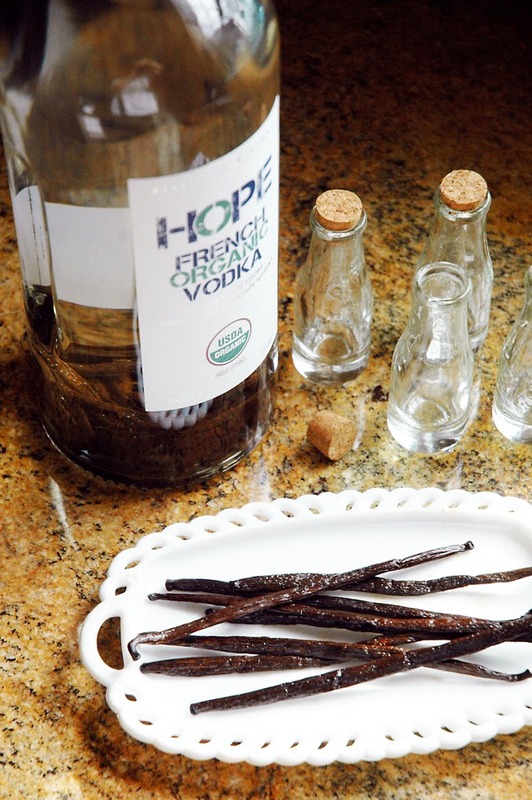 If you want yours to be organic then choose organic brands of vodka and vanilla beans. Otherwise, if you couldn't care less about your vanilla extract being organic then choose any grade/quality of vodka (the cheap stuff is fine) and just make sure your Madagascar Vanilla Beans are of the highest quality. (look for moistness in the packaging). 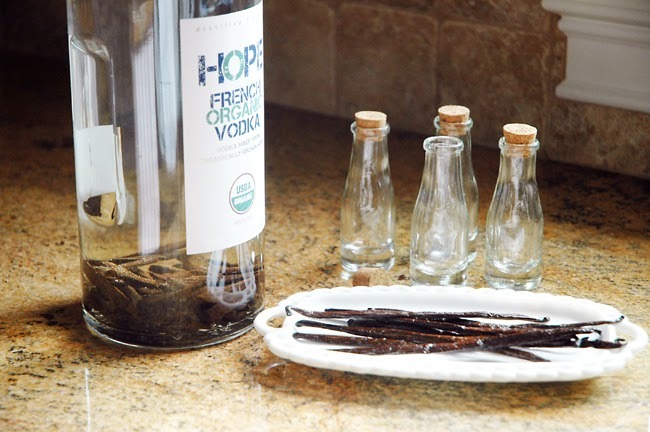 The amount of vodka + vanilla beans you need really depends on how much you want to make and how quickly you'll be using your Homemade Vanilla Extract. 1 cup of Vodka + 5-7 Vanilla Beans = 2 - 4oz. bottles of vanilla extract. 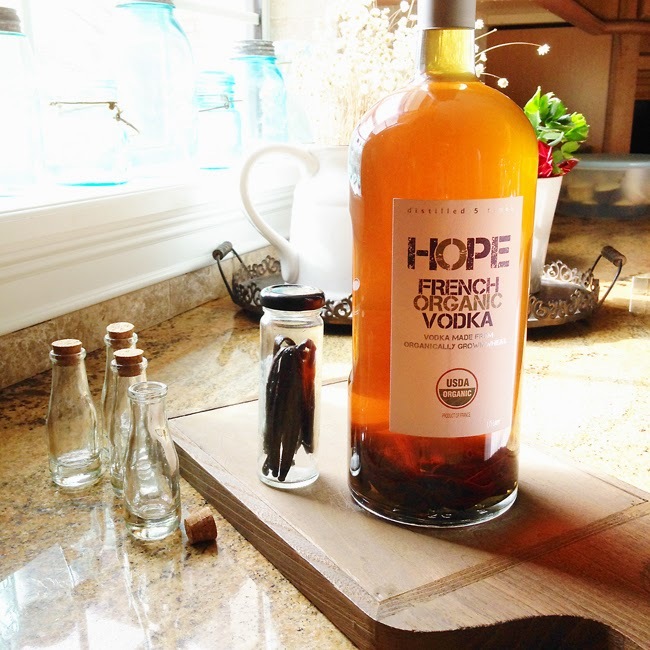 For me, I want to make a A LOT at one time and I'm curing mine for a full year so I bought a 1.75L bottle of Hope French Organic Vodka and cut up 16 Organic Madagascar Vanilla Beans. I'll walk away with about 12 small 4oz. bottles of homemade vanilla extract for gifting. I will be starting another batch here in the next couple of weeks so I can let it age for a few months and I won't have to mess with this particular bottle that I'm letting mature for the entire year. Once I open, use or gift a batch, I will immediately start a new one to replace it. Slice each vanilla bean into thirds. Add beans to glass jar. Pour in vodka and make sure the vanilla beans are completely covered. Put on the lid and give it a swirl. Swirl the vodka and beans around once or twice a week over the course of 6 weeks. Pour prepared Vanilla in glass jars for gifting. TIP: If you find vanilla specks in your vanilla extract and prefer a more clear extract you can strain it through a coffee filter prior to pouring into your prepared bottles. Pour out a little bit of the vodka from the bottle to make room for the vanilla beans. 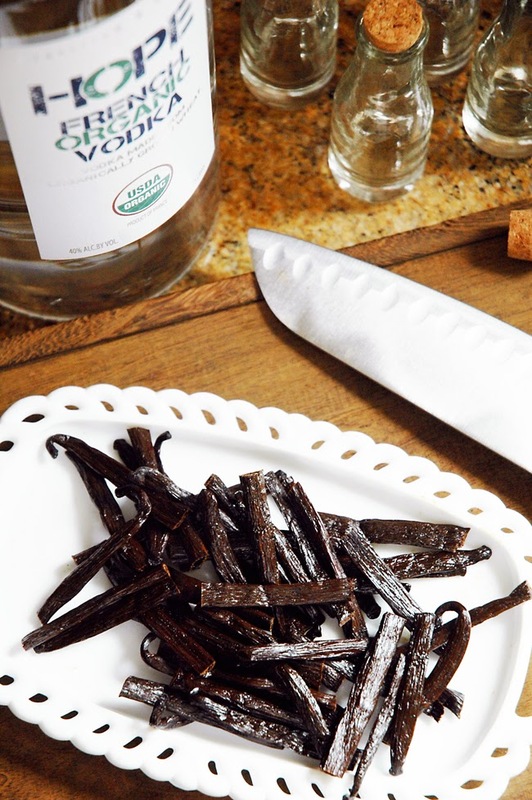 Using a sharp knife, slice your vanilla beans into thirds and drop into your bottle of vodka. Close tightly and swirl it around a little bit. Shake the bottle every week for the first 4-6 weeks. Continue to shake the bottle at least every few weeks. Let it mature for at least 6 months. One year is best and 2 years is even better. The photo above is what it looks like right after adding the vanilla beans to the vodka. The photo below is after 3 weeks of curing. Notice that I'm storing the extra vanilla beans I had from my package in a recycled caper jar. I just folded them in half and stuck them in the jar. I'm saving them for when I start my next batch. (properly stored, these beans can last a year and sometimes even more depending on conditions). It's not necessary to purchase bottles for gifting at this point - you've got at least 6 weeks if you are doing the small batch and nearly a year if you are curing yours for holiday gift giving. However, if you want to get a jump start on it, these 4 oz. Boston Round Bottles come in a pack of 12 and are ideal for gift giving. 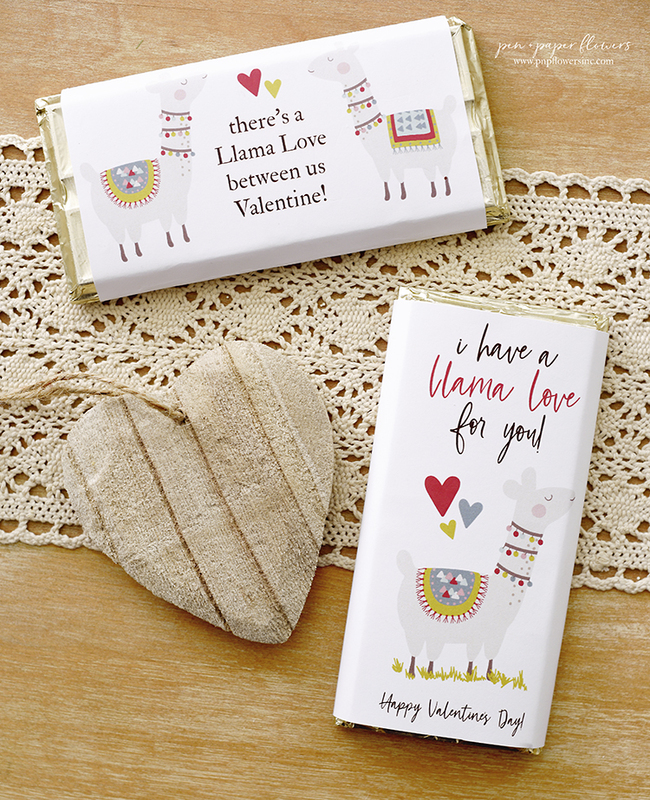 They look really cute with a label too and have plenty of space for cute label customization. The cute clear corked bottles from Hobby Lobby you see in the photos are ones I picked up prior to the holidays. They are smaller than 4oz. and they actually came with a wire for hanging - I just used wire cutters to remove it. If you go that route...make sure you check to make sure the corks on your bottles actually fit properly before you leave the store. I had one of the corks accidentally fall inside of the bottle when I picked it up off the shelf in Hobby Lobby. It was obviously too small but I would've been really bummed had I not noticed it until I got home. If you go with a corked bottle for packaging I advise against shipping it. Hand-delivery is preferred. Anyway - I sure hope you'll join me in making some homemade vanilla extract. I'll share some packaging and labeling ideas when I actually package mine all up. Madagascar Vanilla Beans - I've used these too but they aren't organic - if that matters to you. The PNPF Book Club starts February 1st! 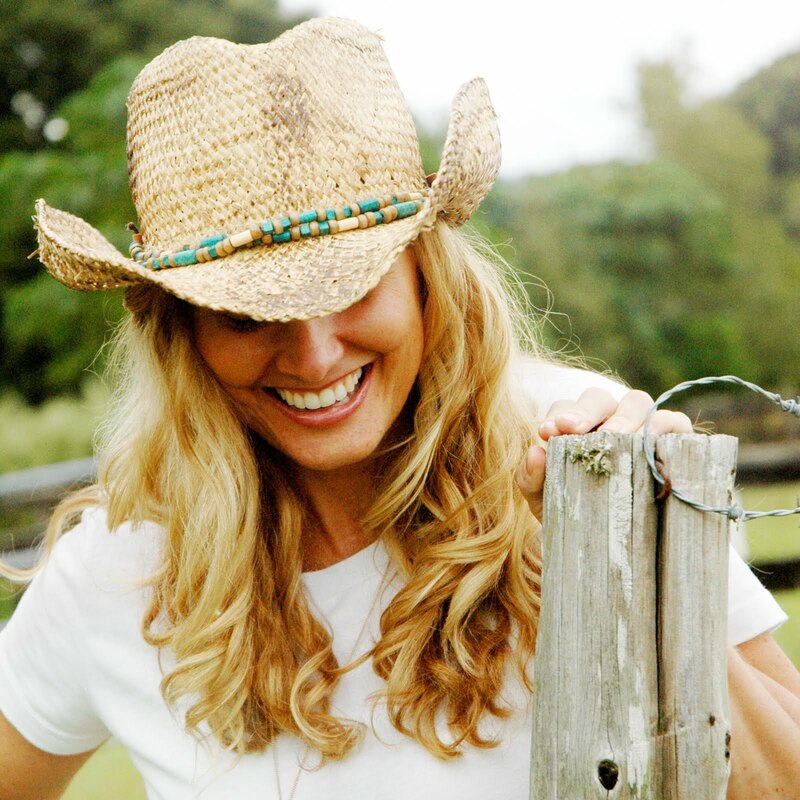 Did you get your "May You Live A Life You Love" Book yet? That's a BIG ol' bottle of Vodka people. I'm not a drinker, at least I haven't been a drinker in many, many moons.